As humans, we spend on average 25 years sleeping - that's a third of our life! Someone who never underestimates the power of a good night's sleep is New Zealand beauty, Maia Cotton. As a busy model, and one of the faces of our new Comfy Livin' campaign, we caught up with Maia to get the lowdown on her evening routine, self-care tips, and how she likes to relax after a long day. Tell us about your night-time beauty routine. My evening skincare routine is very simple. I remove any makeup with Bioderma Micellar water, then cleanse and moisturise with the Barbara Sturm foaming cleanser and Barbara Sturm face cream. I also apply the Sunday Riley Juno Face Oil and Glossier lip balm. How do you wind down after a big day? The first thing I do is change in to something comfortable. The Comfy Livin' Robe is a must. It’s the best part of coming home after a big day! Then I usually like to play some music and read. It’s my remedy to take my mind off of any stresses during my day, and there’s nothing better than a good book. What are your favourite self-care activities? Taking time to cook a delicious meal, having my nails done, and applying a face mask. What’s your approach to sleep? I think a good night’s sleep is as important as a healthy diet or exercise. I try to get at least 6-8 hours every night! What’s your best sleep tip for a good night’s sleep? Taking a moment to put my phone down and practice a bed time routine at the same time every evening. I think having an evening routine helps the body become aware it’s time to wind down and relax. What Comfy Livin' items are your must haves for a good night? The Comfy Livin' jersey robe is my favourite thing to get super cosy. 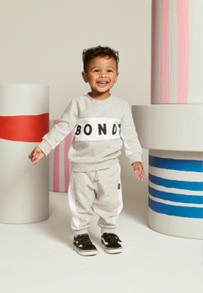 Explore the new Bonds Comfy Livin' collection for men and women in store & online here.